Just a reminder, The Pencil has forwarded a communique to Kevin Culbertson, newly-named general manager of radio station WFHB, offering him an opportunity to introduce himself to Bloomington here. Meanwhile, the new Facebook group, Friends of WFHB, has garnered nearly 200 members as of this morning. WFHB volunteer member Maryll Jones has been running herself ragged administering the page as well as keeping certain group members from tearing each other limb from limb. 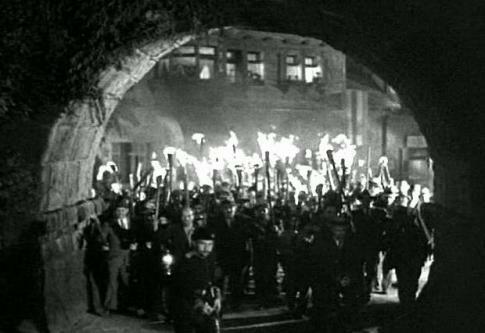 Who’da thunk the selection of a GM would arouse such fire within the populace? Anyway, the discussion on the space is lively, if at times a little hair-raising. Along those lines, one disgruntled WFHB listener apparently sent an email to station Board members, threatening physical violence. The missive scared the bejesus out of the Board-ers. Jones has issued a Code of Conduct for Friends of WFHB members although it’s not known if the threatener is himself a member. (And, to be sure, it was a guy, wouldn’t you think?) In any case, the cops are snooping around to find out who sent the email. Oh, one more thing. Personal to Maryll Jones: Pick up your guitar, woman! Worry not, Pencillistas, this is not really a sports story. It’s about racial politics and business in the Deep South. That out of the way, it was learned yesterday that Major League Baseball’s Braves will be leaving their relatively shiny new home in downtown Atlanta for the greener…, check that, whiter pastures of Cobb County. 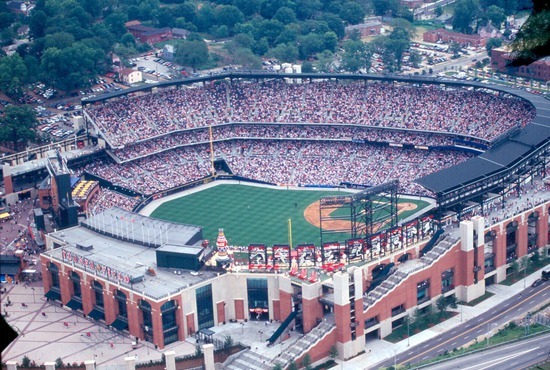 The Atlanta Committee for the Olympic Games, NBC Sports, and other Olympics sponsors built the Braves’ current home, Turner Field, for the 1996 Summer Olympics. It was called Centennial Olympic Stadium that year. The next year, the Braves moved in. So the team has been playing in Turner for a total of 16 years. The Braves plan to move into their new digs for the 2017 baseball season. Turner Field cost $209 million to build. After the Olympics, Atlanta sunk another pile of dough into retrofitting the place to accommodate big league baseball and just shy of ten years later the Atlanta-Fulton County Recreation Authority dropped another huge wad of cash into renovations for the place, including what was hailed at the time as the world’s largest high definition video screen scoreboard. The A-FCRA says it will demolish the stadium after the Braves leave. So, the joint will have had a useful life of fewer than 20 years. All for a pricetag well north of a half billion dollars, of which taxpayers footed a sweet $300 mill. A not-quite 20-year-old stadium is merely a young punk when compared to such geezers as Dodger Stadium in Los Angeles (51 years old this year) and the Coliseum in Oakland (47), as well as Methuselahs such as Wrigley Field (99) and Fenway Park (101). The Braves swear their current home is dilapidated and so old-fashioned that the team can hardly make a penny playing there. Let me go out on a limb here and tell you the real reason the Braves want out of their new-ish stadium. It stands in downtown Atlanta just off I-75 and near many of the city’s other public and cultural institutions. It’s also surrounded by black Atlanta. In Georgia, that’s bad business. Almost very other baseball stadium built since 1991 has been located in downtown areas (that’s 19 out of the 30 in use today). Sports franchises want to play games in downtown areas because, unlike the 1950s, 60s, and 70s, those areas now are vibrant, rejuvenated, exciting places to be. Decades ago, whites shunned big city downtowns because they were scared to death of catching cooties from Negroes. In the ensuing years, America has witnessed a gradual acceptance of mixed-race couples, has embraced a black woman (Oprah) as pied piper for the housewife set, and has even elected a brown president. What were once deserted downtown streets after 5:00pm everywhere from Chicago to Cleveland now are destinations for dining, entertainment, and shopping. Oh sure, many, many, many black residents were pushed out of these downtowns and surrounding environs by gentrification, but even that process required white people to at least tolerate seeing black faces while the demographics changed. And in those cities where downtown gentrification is complete, middle- and upper-middle class blacks are welcome to live there. The nation has changed a bit. For all it’s self-advertisements as a beacon of modernity of the South, Atlanta is still full of…, well, Georgians. 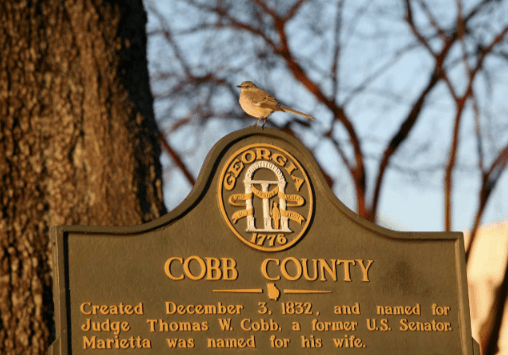 And very few places are more Georgian than Cobb County. Which is where the Braves are moving. The Braves released a chart revealing most of its season ticket-holding base lives in that most Georgian of locales. It’s a gang that isn’t terribly pleased about riding into downtown Atlanta to watch a baseball game. It is, remember, full of Negroes. I have a new team to root against now. Mikey: Were I sitting across from you I think I would have felt a kick in the shins from your knee jerk. The Brave’s stadium is in a relatively high crime area of Atlanta that is mostly black. The situation is similar in Chicago with the White Sox versus the Cubs. High crime equals blight. I think criticizing people for not wanting to go there is misguided. Instead, work on reducing the crime rate. Why not try stop and frisk? It’s not certain but very plausible this has reduced crime some in the high crime areas of NYC. Why not try jobs and economic development? How about better schools and community services? How about not filling the jails with black drug violators while white violators walk? How about banks and grocery stores maintaining presences in these neighborhoods? How about creating real opportunities rather than cordoning off the area and letting it rot? You’ll pardon me while my knee jerks again and again and again and ag…. The jobs that a person with only a high school diploma or less could get are gone and unlikely to come back. Schools will be better when parenting is better and the percentage of imprisoned blacks would be the same (more than 30%) if drug violators of all races were released. No sir, the maladies of the inner cities are largely self-inflicted. Fathers need to be real and not just biological.